Can a single person do anything to change the entire world? I didn’t use to think so. Then I became a mom. In the wake of shootings, bombings, bullying, suicides, abuse, and other violence that seem to proliferate the national and international news, it’s difficult to imagine that something I do in my home, on my little piece of the Earth, is making a difference. And maybe it doesn’t make a difference immediately. I could not have single-handedly stopped any of the awful things that have happened recently. But I think about what might have been missing in the lives and hearts of some of the people who have perpetrated this violence, and empathy is at the top of the list. Could someone that feels what another person is feeling from that person’s perspective find it in themselves to terrorize and kill? On a smaller scale, could someone with a strong sense of empathy find it easy to bully, to abuse, to ignore those in need? I don’t think so. When we step in to the figurative shoes of another person, those with a strong sense of empathy feel the other’s pain, happiness, joy, fear, excitement. They delight in the gladness of others and weep for those in turmoil. Instead of acting from a place of selfishness and caring only how their actions make them feel, they broaden their perspective and consider others. Instead of laughing at another person’s mistake or misfortune, they see if they can help. Instead of accepting poisonous vitriol for truth, they see the humanity in the people they are being asked to view as enemies. Small scale to large scale. So then, how does peace begin with me? to listen with my heart when my kids talk to me. By helping develop my children’s sense of empathy, I will bring peace to the Earth, if only a small corner. Imagine if everyone did the same. 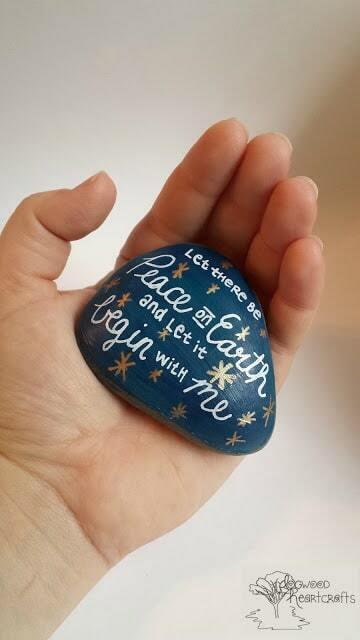 To help me remember to bring empathy and compassion into my home this holiday season, I painted these decorative stones. 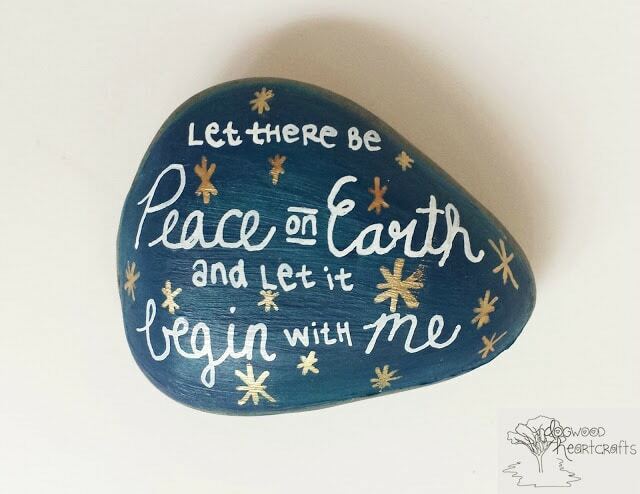 I have mine sitting next to my kitchen sink as a reminder to choose peace throughout the holiday season. Where would you set your stone? Cassie Nowacki left her professional career to raise her two bright, busy little boys. Inspired to make toys and paintings for her kids, she discovered that she was an artist at heart. 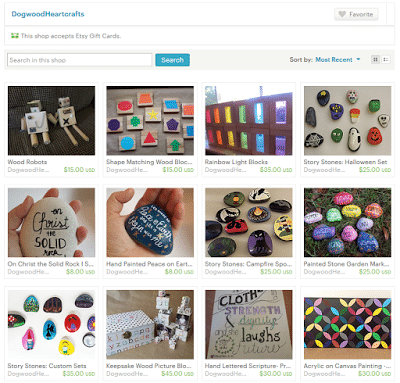 She is married to an amazing and equally creative husband who helps out in her Etsy shop as well. About my shop: When I was pregnant with my youngest son I decided I wanted to make gifts for my kids that could double as keepsakes. I felt like I was wasting money on gifts that would be cast aside too soon. I started with some canvas paintings as nursery decor for the new baby, a set of hand painted story stones for my oldest, rainbow light blocks for them to explore building, color, and light, and a set of keepsake wooden blocks for my youngest’s first birthday with a picture from each of his first twelve months on the blocks. It took others to point it out, but I had become an artist. My Etsy shop is an extension of my personal endeavor to give meaningful gifts to my kids and to keep the artist in me alive. It has allowed me to share these items with others so that they may give and receive these keepsakes. From someone who has a mom who has changed my life profoundly, believe me when I say that you are doing a good work with your children and they will never forget it!